A Sari, saree, sadi, or shari[note 1] is a South Asian female garment that consists of a drape varying from five to nine yards (4.57 metres to 8.23 metres) in length and two to four feet (60 cm to 1.20 m) in breadth that is typically wrapped around the waist, with one end draped over the shoulder, baring the midriff. The sari is usually worn over a petticoat (called 'parkar' (परकर) in Marathi lahaṅgā or lehenga in the north; seelai in Tamil, pavada (or occasionally langa) in Malayalam, Kannada and Telugu, chaniyo, parkar, ghaghra, or ghagaro in the west; and shaya in eastern India), with a fitted upper garment commonly called a blouse (ravike in South India and choli elsewhere). The blouse has short sleeves and is usually cropped at the midriff. The sari is associated with grace and is widely regarded as a symbol of Indian, Nepalese, Bangladesh, and Sri Lankan cultures. The word sari described in Sanskrit शाटी śāṭī which means 'strip of cloth' and शाडी śāḍī or साडी sāḍī in Prakrit, and which was corrupted to sāṛī in Hindi. The word 'Sattika' is mentioned as describing women's attire in ancient India in Buddhist Jain literature called Jatakas. This could be equivalent to modern day 'Sari'. The term for female bodice, the choli is derived from another ruling clan from ancient Tamil Nadu, the Cholas. Rajatarangini (meaning the 'river of kings'), a tenth-century literary work by Kalhana, states that the Choli from the Deccan was introduced under the royal order in Kashmir. In the history of Indian clothing the sari is traced back to the Indus Valley Civilisation, which flourished during 2800–1800 BC around the western part of the Indian subcontinent. Sari draping leaves back,cleavage,and side view of belly bare.The origin of such exposing attire can be attributed to humid climate of the land.The earliest known depiction of the sari in the Indian subcontinent is the statue of an Indus Valley priest wearing a drape. Ancient Tamil poetry, such as the Silappadhikaram and the Sanskrit work, Kadambari by Banabhatta, describes women in exquisite drapery or sari. The ancient stone inscription from Gangaikonda Cholapuram in old Tamil scripts has a reference to hand weaving. In ancient Indian tradition and the Natya Shastra (an ancient Indian treatise describing ancient dance and costumes), the navel of the Supreme Being is considered to be the source of life and creativity, hence the midriff is to be left bare by the sari. In South India and especially in Kerala, women from most Hindu communities wore only the sari and exposed the upper part of the body till the middle of the 20th century. Poetic references from works like Silappadikaram indicate that during the Sangam period in ancient Tamil Nadu, a single piece of clothing served as both lower garment and head covering, leaving the midriff completely uncovered. 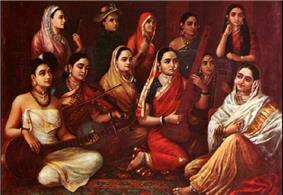 Similar styles of the sari are recorded paintings by Raja Ravi Varma in Kerala. 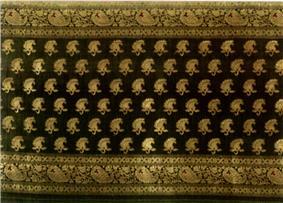 By the mid 19th century, though, bare breasted styles of the sari faced social revaluation and led to the Upper cloth controversy in the princely state of Travancore (now part of the state of Kerala) and the styles declined rapidly within the next half a century. ^ a b c d e f g h Boulanger, Chantal; (1997) Saris: An Illustrated Guide to the Indian Art of Draping, Shakti Press International, New York. Even popular Hollywood celebrities have worn this traditional attire. Pamela Anderson made a surprise guest appearance on Bigg Boss, the Indian version of Big Brother, dressed in a sari that was specially designed for her by Mumbai-based fashion designer Ashley Rebello. Ashley Judd donned a purple sari at the YouthAIDS Benefit Gala in November 2007 at the Ritz Carlton in Mclean, Virginia. There was an Indian flavour to the red carpet at the annual Fashion Rocks concert in New York, with designer Rocky S walking the ramp along with Jessica, Ashley, Nicole, Kimberly and Melody – the Pussycat Dolls – dressed in saris. As a nod to the fashion-forward philosophy established by the designs of Emilio Pucci, the now-defunct Braniff International Airways envisioned their air hostesses wearing a more revealing version of a sari on a proposed Dallas-Bombay (conceivably via London) service in the late 1970s. However this was never realised because of Halston's resistance to working with a palette outside of his comfort zone. The former Eagan, Minnesota–based Northwest Airlines considered issuing saris to flight attendants working the Minneapolis-Amsterdam-Delhi route that began in the 1990s. This never occurred largely because of a union dispute. Aishwarya bachchan in a sari at the London premiere of her film Raavan. In modern times, saris are increasingly woven on mechanical looms and made of artificial fibres, such as polyester, nylon, or rayon, which do not require starching or ironing. 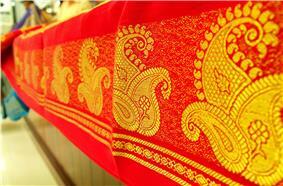 They are printed by machine, or woven in simple patterns made with floats across the back of the sari. This can create an elaborate appearance on the front, while looking ugly on the back. The punchra work is imitated with inexpensive machine-made tassel trim. Ameesha Patel in a modern sari with decorative borders and choli. Sari's have been worn by the Afghan royal family house and upper family classes as well by Muslim women at special functions. The sari is the most commonly worn women's costume in Nepal. 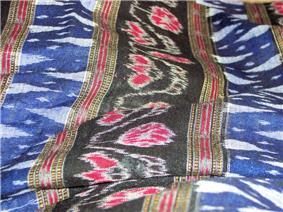 In Nepal, a special style of sari draping is called haku patasihh. The sari is draped around the waist and a shawl is worn covering the upper half of the sari, which is used in place of a pallu. Sharee or saree (in Bengali=শাড়ি) is the national wear of Bangladeshi women. Most women who are married wear sharee as their regular dress while young-unmarried girls wear sharee as an occasional dress. The shari is worn by women throughout Bangladesh. Sari is the most popular dress for women in Bangladesh, both for casual and formal occasion. Although Dhakai Jamdani (hand made shari) is worldwide known and most famous to all women who wear shari but there are also many variety of shari in Bangladesh.There are many regional variations of them in both silk and cotton. e.g.- Tanta/Tant cotton shari, Dhakai Benaroshi shari, Rajshahi silk shari, Tangail Tanter shari, Tassar silk shari, monipuri shari and Katan shari are the most popular in Bangladesh. Similarly, the female politicians of India wear the sari in a professional manner. 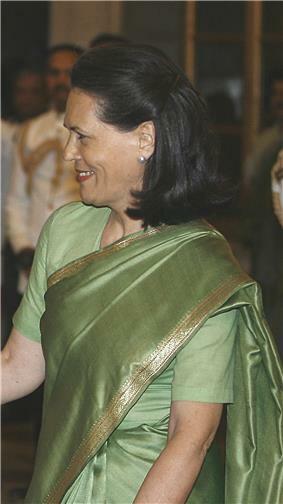 The women of Nehru–Gandhi family like Indira Gandhi and Sonia Gandhi wear the special blouse for the campaign trail which is longer than usually and is tucked in to prevent any midriff show while waving to the crowds.Stylist Prasad Bidapa has to say, "I think Sonia Gandhi is the country's most stylish politician. But that's because she's inherited the best collection of saris from her mother-in-law. I'm also happy that she supports the Indian handloom industry with her selection." BJP politician Sushma Swaraj maintains her prim housewife look with a pinned-up pallu while general secretary of AIADMK Jayalalithaa wears her saris like a suit of armour. Because of the harsh extremes in temperature on the Indian Subcontinent, the sari fills a practical role as well as a decorative one. It is not only warming in winter and cooling in summer, but its loose-fitting tailoring is preferred by women who must be free to move as their duties require. For this reason, it is the costume of choice of air hostesses on Air India. This led to a professional style of draping a sari which is referred to "Air-Hostess style sari". An air hostess style sari is tied in just the same way as a normal sari except that the pleats are held together quite nicely with the help of pins. A bordered sari will be just perfect for an Air-Hostess style drape where the pallu is heavily pleated and pinned on the shoulder. Even the vertical pleats that are tucked at the navel are severely pleated and pressed. 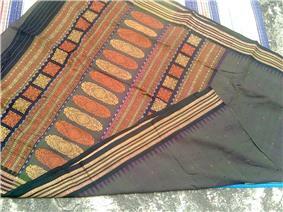 Same goes for the pallu pleats that are pinned at the shoulder. To get the perfect "Air-hostess" a complimentary U-shaped blouse that covers the upper body completely is worn which gives a very elegant and formal look. Mastering the "Air-hostess" style drape helps to create the desired impact in a formal setting like an interview or a conference. The chiffon sari did what years of fashion interaction had not done in India. It homogenised fashion across this land. Its softness, lightness and beautiful, elegant, caressing drape was ideally suited to the Indian climate. Different courts adopted their own styles of draping and indigenising the sari. In most of the courts the sari was embellished with stitching hand-woven borders in goldfrom Varanasi, delicate zardozi work, gota, makaish and tilla work that embellished the plain fabric, simultaneously satisfying both traditional demands and ingrained love for ornamentation. Some images of maharanis in the Deccan show the women wearing a sleeveless, richly embellished waistcoat over their blouses. The Begum of Savanur remembers how sumptuous the chiffon sari became at their gatherings. At some courts it was worn with jaali, or net kurtas and embossed silk waist length sadris or jackets. Some of them were so rich that the entire ground was embroidered over with pearls and zardozi. The nivi is today's most popular sari style from Andhra Pradesh. The increased interaction with the British saw most women from royal families come out of purdah in the 1900s. This necessitated a change of dress. 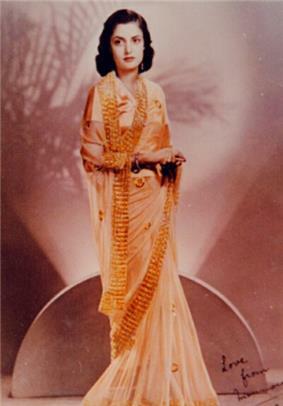 Maharani Indira Devi of Cooch Behar popularised the chiffon sari. She was widowed early in life and followed the convention of abandoning her richly woven Baroda shalus in favour of the traditional unadorned white. Characteristically, she transformed her "mourning" clothes into high fashion. 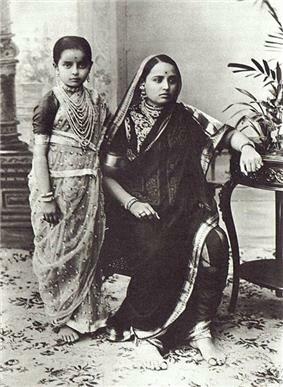 She had saris woven in France to her personal specifications, in white chiffon, and introduced the silk chiffon sari to the royal fashion repertoire. Maharashtrian/Konkani/Kashta; this drape is very similar to that of the male Maharashtrian dhoti. The centre of the sari (held lengthwise) is placed at the centre back, the ends are brought forward and tied securely, then the two ends are wrapped around the legs. When worn as a sari, an extra-long cloth of nine yards is used and the ends are then passed up over the shoulders and the upper body. 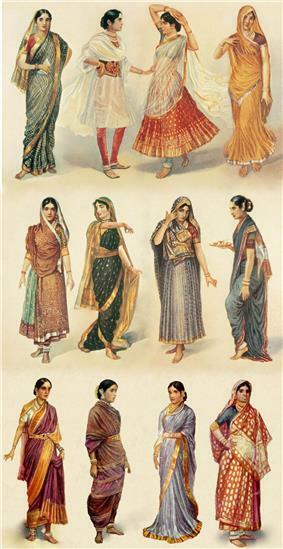 They are primarily worn by Brahmin women of Maharashtra, Karnataka, Andhra Pradesh and Goa. Gond – sari styles found in many parts of Central India. The cloth is first draped over the left shoulder, then arranged to cover the body. Kunbi style or denthli:Goan Gauda and Kunbis,and those of them who have migrated to other states use this way of draping Sari or Kappad,this form of draping is created by tying a knot in the fabric below the shoulder and a strip of cloth which crossed the left shoulder was fasten on the back. There are more than 80 recorded ways to wear a sari. Fashion designer Shaina NC declared, "I can drape a sari in 54 different styles".